I found this fun idea on Crafty Crow. I cut coffee filters into egg shapes. 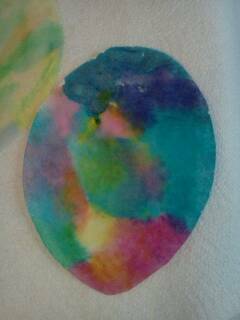 The kids had fun using watercolors to decorate them. Nice blog, i hope it's helpful for my Air cleaner business. It control the indoor air quality by reducing pollutants that can contribute to headache, lung irritation and fatigue as well as more long-term conditions such as asthma, allergies and infectious diseases. I hope you like it.